Pours a very dirty dark orange - kind of ugly. The one finger white head actually sticks around for a while. This is quote a hop bomb. Also getting a good whiff of pine, resin, and it's also rather sweet like a candied orange. Quite a bit of malt on the aroma as well. It's not exactly juicy, but it is juicier than I expected. At 11.00% this could qualify as a "Triple IPA" and as such I was expecting a thick, syrupy, resinous bomb to invade my palate, but that is simply not the case. I get a semi-sweet, juicy hop presence at the front and on the back end it is all bitter hops which finishes dry. It doesn't have the typical onion/garlic taste I get with a lot of "West Coast" style IPA's, and that's a relief. The aftertaste is mostly pine needles and something I'd call juicy resin. It leaves a slight warming sensation in your throat, but it is by no means burning. 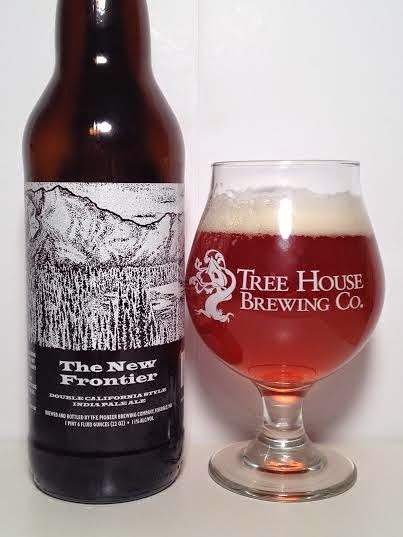 At 11.00% abv, New Frontier Double California IPA drinks very nicely and doesn't leave the palate completely annihilated by bitterness and resin. While it does have a decent orange juice flavor for 11.00%, I wouldn't say that is the defining flavor throughout. A noticeably sticky sensation can be a slight turnoff, but for a Double IPA this big, it is one of the more smoother-drinking ones in it's alcohol range.